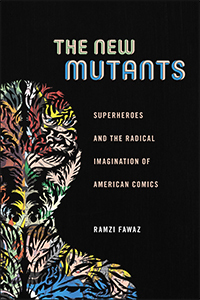 The New Mutants: Superheroes and the Radical Imagination of American Comics (New York: NYU Press, January 2016). “Introduction: Queer About Comics,” a special issue of American Literature 90.2 (June 2018), edited by Ramzi Fawaz and Darieck Scott. Available here. “Stripped to the Bone: Sequencing Queerness in the Comic Strip Work of Joe Brainard and David Wojnarowicz,” ASAP/Journal 2.2 (May 2017). Available here. “‘I Cherish My Bile Duct as Much as Any Other Organ’: Political Disgust and the Digestive Life of AIDS in Tony Kushner’s Angels in America,” Special Issue On the Visceral, edited by Marcia Ochoa, Sharon Holland, and Kyla Wazana Tompkins. GLQ 21.1 (2015): 121-152. Available here. “Space, That Bottomless Pit: Planetary Exile and Metaphors of Belonging in American Afrofuturist Cinema.” Callaloo 35.4 (2012): 1103-1122. “‘Where no X-man has Gone Before!’ Mutant Superheroes and the Cultural Politics of Popular Fantasy in Postwar America.” Special Issue on Speculative Fictions, ed. Priscilla Wald and Gerry Canavan. American Literature 83.2 (Summer 2011): 355-388. “The Difference A Mutant Makes,” Op-ed for Avidly, the LA Review of Books blog (January 28th, 2016). Available here. Ramzi Fawaz and Phil Jimenez in conversation at The Strand Bookstore for the launch of The New Mutants. YouTube link. My research and writing explores the relationship between popular culture and radical social movements in the modern United States. I am especially interested in the ways that movements for women’s and gay liberation, black power, AIDS activism, and the third-world left have used literature, film, and visual media as vehicles for giving voice to commonly marginalized groups like people of color, women, sexual and gender outlaws, and the disabled. I am drawn to the question of how cultural production – the making and telling of stories in various mediums and genres – has been used by these groups to participate in American political life when other avenues of civic engagement have been denied them. In other words, my work asks how reading and writing books, making and watching movies, drawing and interacting with comics and visual art among countless other cultural activities become ways for people to participate in democracy and envision the kind of social and political world they desire, and perhaps might one day bring into being. My work is heavily influenced by queer theory – the study of the political and social dimensions of sexuality and desire – and often focuses on the cultural production of LGBT writers and artists. In my courses, I work to reconstruct the lived experience of producing and consuming literature and popular culture intended to transform the political commitments of particular audiences; in turn, I encourage students to inhabit the identities and worldviews of creators and audiences whose experiences (which might include being a closeted government worker in the 1950s, a gay member of the New Left in the 1960s, a radical feminist in the 1970s, or an AIDS activist in the 1980s) might seem vastly different than their own. I want us to see how queer literature and popular culture offers ways of understanding people who might appear radically different from the status quo, develops a variety of critiques of that status quo, and articulates the desire for a different world. What that “different world” might be is usually the topic of my courses. I am currently completing a new book titled Queer Forms, which explores the influence that movements for women’s and gay liberation in the 1970s had on American popular culture. Throughout this period, feminist and queer activists fought social and political battles to expand or wholly transform definitions of so-called “normal” gender and sexuality; one effect of this project was to encourage artists, writers, and filmmakers to invent new ways of formally representing, or giving shape to, non-normative genders and sexualities. Through case studies of queer and feminist cultural productions including Armistead Maupin’s serial fiction Tales of the City (1976-1983), Lizzy Borden’s dystopian film Born in Flames (1983), and Tony Kushner’s epic play Angels in America (1989-1991), I show how artists innovated in many popular mediums and genres to make the experience of gender and sexual non-conformity recognizable for mass audiences in the modern US. In so doing, I narrate the pre-history of the contemporary renaissance in LGBTQ political activism and culture by developing a genealogy of late twentieth-century artifacts that projected images of gender and sexual rebellion, which came to infuse the American popular imagination in the 1970s and after. Queer Forms will be published by NYU Press. 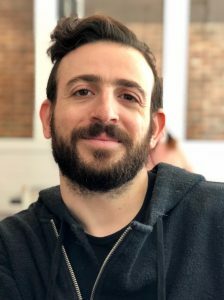 Ramzi Fawaz. The New Mutants: Superheroes and the Radical Imagination of American Comics. NYU Press, 2016.